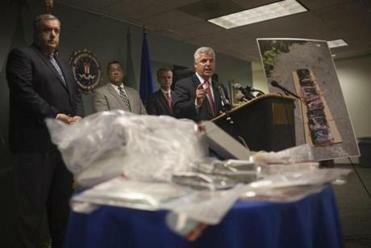 Richard DesLauriers, special agent in charge of the FBI’s Boston division, spoke during a press conference announcing the takedown of an alleged multimillion-dollar drug ring. They had gone from renting apartments to buying houses. They were buying expensive champagne at clubs around Boston and Rhode Island. Some were driving Mercedes Benz cars and taking more frequent trips to their native country, the Dominican Republic. Members of the Boylston Street gang were unemployed, police said, but were heedlessly spending money, and raising suspicions. 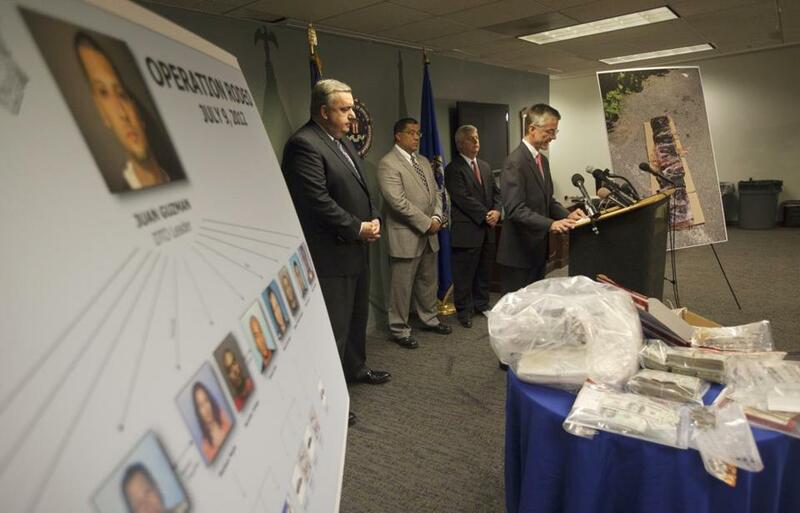 The drug unit, along with the FBI, arrested 14 people Monday morning, most of them purported members of the Boylston Street gang, a Jamaica Plain group that investigators estimate brought hundreds of kilos of cocaine into the state. Police moved in on the gang after they learned a large shipment of cocaine was scheduled to come into the city. The gang was known for drug dealing, but police did not learn how organized the operation was until about a year ago, when they began monitoring the group in response to a surge in violence that authorities believed was connected to the drug trade. Commissioner Edward F. Davis ordered the drug unit to focus on violent offenders, following a strategy that it is easier to prosecute criminals for drugs than shootings. The drug unit focused on Boylston Street at the peak of its feud with its rival, Mozart Street, another Jamaica Plain gang whose members are also largely Dominican. By late 2010, nine people had been killed in the feud — one of them while he was visiting the Dominican Republic. But Boylston was behind the majority of shootings, Merner said. In 2011, violence between the two groups began to ebb, the result of arrests of members of both gangs, deaths of key players, and the arrest of Juan “White Boy” Guzman, one of the purported leaders of the Boylston Street gang. Merner theorized that Guzman, who is 33 and currently serving a 2½-year sentence on gun and drug charges, told his associates to stand down. Elliot Weinstein, who represented Guzman on the charges that led to his conviction, said his client has yet to be charged with any new crimes. “We will aggressively and successfully defend any charges that are brought,” Weinstein said. Prosecutors said Guzman’s case is expected to go before a Suffolk grand jury. Merner said Guzman found a way to keep his drug operation going from his cell at the Massachusetts Correctional Institution at Concord. Police listened in on his conversations with associates as he discussed, sometimes for hours, banal topics like birthday parties or his associate’s children. “And then there’d be one brief sentence,” Merner said. About three or four months ago, police started using a wiretap to listen in on cellphone calls among Guzman’s associates. They spoke in code, but investigators were able to learn through the wiretaps that a major cocaine shipment was coming into the city, Merner said. He declined to provide specific details on the shipment, but said investigators moved quickly on the arrests after they learned about it. Officials said the drug operation likely had been running for several years. The cocaine, which investigators say came from Mexico, was sold several kilos at a time through distributors to dealers. Investigators believe the drugs were then sold at the street level around Dorchester, East Boston, and Roslindale, but also as far as Ayer. Suffolk District Attorney Daniel F. Conley said Monday that the drug operation brought in several million dollars, but investigators are still combing through financial records to determine a more precise amount. According to officials, Guzman said in recorded conversations that he had not held a job for 12 years and had a Discover credit card in default, with more than $6,000 of charges on it. But authorities allege that he amassed a fortune through the drug trade and brought three women with no criminal records into his operation. He instructed his fiancée, Melissa Mejia, to deposit the money into accounts at three downtown Boston banks. Guzman’s sister, Maria Guzman, allegedly managed bank accounts and safety deposit boxes connected to the drug operation. Both women have pleaded not guilty. On Monday, officials seized more than $500,000 in cash and four vehicles, including a Mercedes Benz. On Tuesday, investigators searched a safety deposit box in Maria Guzman’s name and found $65,000 cash, three loose diamonds between 1.5 and 2 carats, two men’s diamond rings, two Breitling watches — one gold and and one platinum — and several wallets and bail receipts. Gang members who were arrested and held on large bail amounts were being bailed out with cash, police said, another clue to the success of the drug ring. Weinstein, who is also representing Maria Guzman, declined to comment on the charges. Mejia’s mother, 55-year-old Martha Tejeda, an unemployed housecleaner, was arrested and held on $25,000 cash bail. She was accused of operating one of the bank accounts. Her lawyer, Andrew Stockwell-Alpert, described Tejeda as a US citizen and mother of three, with no criminal record, who has no idea why she was arrested. Though authorities announced Monday’s arrest with great fanfare, the sweep was not the biggest in the city. In 2005, the police department helped federal authorities take down a gang that was believed to have amassed $50 million in 10 years selling crack cocaine. Eleven men were charged in federal court. But Jake Wark, Conley’s spokesman, said Monday’s takedown was the largest state-level case in a decade. The 14 defendants are likely to be prosecuted in Suffolk Superior Court. State Senator William N. Brownsberger, a Belmont Democrat and former narcotics prosecutor with the state attorney general’s office, said the department’s strategy to target violent offenders through drug investigations is effective. But he said it’s impossible to know whether the sting will have an overall effect on the drug trade in Boston. Globe staff writer Martine Powers contributed to this report. Maria Cramer can be reached at mcramer@globe.com.